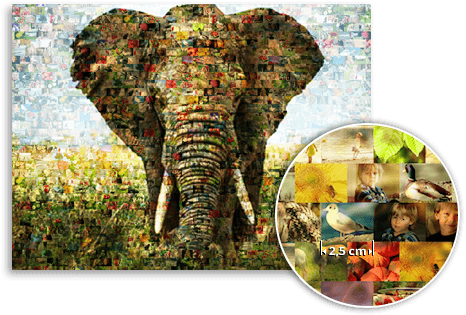 Photo mosaic on canvas - now with FREE delivery! What is a mosaic canvas? A photo mosaic canvas is canvas fabric stretched onto a frame. The fabric is printed with your mosaic motif before being stretched. The canvas is clamped onto the frame. After stretching it is not visible. The woven structure is characteristic of canvas fabric. The fabric is made out of real cotton and weighs about 360 g/m². The stretcher frame is made out of pinewood. 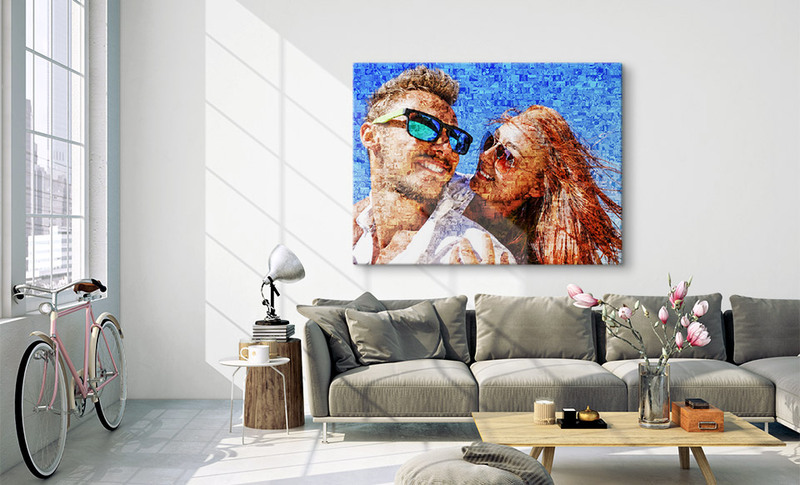 You will receive your mosaic prints already stretched as a photo on canvas. To hang it up all you need is one or two nails. The photo print on canvas can just hang with the frame on the nails. The photo mosaic and the canvas work well together. The natural structure of the canvas supports the pattern of the photo mosaic. The individual images in your mosaic blend together into a piece of art. Which finishes are available for mosaic photo canvas prints? Photo mosaics on canvas are available in many sizes and formats. For this product there are two things that the customer has to decide on: the thickness of the frame edge he style of the edges 2 cm and 4 cm. The size of the edges of your print are available in those thicknesses. Tip: we recommend the 4 cm frame for sizes starting at 100 x 100 cm. The thicker frame provides the canvas more stability. Besides that, frames from that size are stabilized with additional braces. For smaller sizes the 2 cm frame is perfectly suitable. Besides the thickness, the style of the edges can also be chosen. In the ordering process you have the option to choose either a white, black, or completely printed edge. With the options black and white the side edges of the picture will be printed in the chosen color. A completely printed edge wraps the picture around the edges. This creates a 3D effect and continues the picture over all visible surfaces. 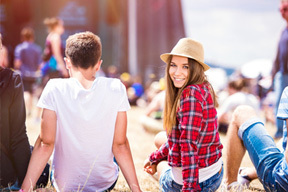 Tip: Use at least 100 little photos. The more photos, the more varied the mosaic canvas will be (max. 1000 photos). Upload your main picture for the mosaic canvas – this will be shown in large on the finished mosaic. Now, in order to create your canvas image from many photos, upload in this step the individual photos. We get to work: Within 24 hours we’ll create a preview for your photo mosaic on canvas. Your preview has arrived! If you like your canvas mosaic, you can now order it. 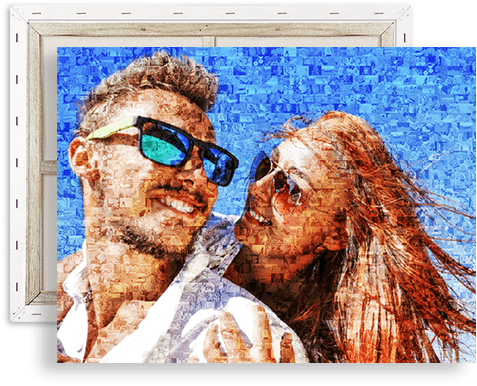 Your mosaic canvas will now be printed and will be delivered in 1-3 days.